If you had a less-than-brilliant Valentines Day, you can at least take comfort in the fact that cold hearts are perhaps more desirable in the current climate. Sweltering hugs, BO laced pashes and sweaty hand-holding are activities that have about as much romance as a box of melted chocolates. 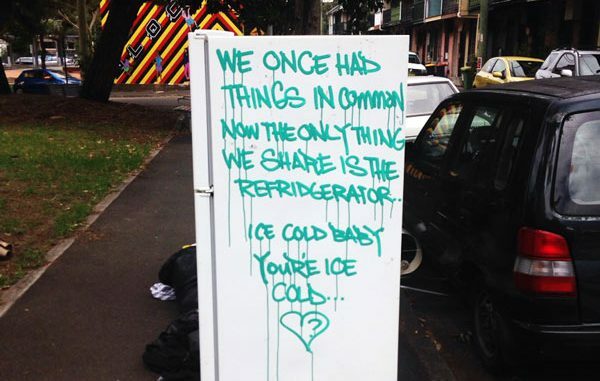 While this fridge poem found in Redfern may be lamenting a distant lover – the fridge itself looks pretty damn attractive from Ciao‘s un-air-conditioned office. Snub your frosty lover. Tis’ the season to get intimate with your fan, public swimming pool and a 24-pack of Zooper Doopers.